Kidrobot-2014 Mardivale Series “Jester” by Andrew Bell. Condition is New. 6" tall and includes accessories. Rotate wheel on Jester's back. watch his face change! Scepter fits in his hand. "Jester's emotions are reflected with a twirl of his multi paneled face, revealing either a deadly smile or a mournful frown.". Download the "Invizimals Revolution" application. Grab now this opportunity and add in your Invizimals collection this cool set. Here you’ll find many beloved toys. for extensive variety. COMBINE THIS SET. Gauntlet - Dark Legacy. (Depends). Puppet Master. by Full Moon Toys. The Living Dead Dolls present DC Comics' classic Harley Quinn in all her deranged glory. Harley Quinn is fashioned on our signature LDD presents body. LIVING DEAD DOLLS: HARLEY QUINN. I appreciate everyone's understanding! McFarlane Toys Titanfall 2 Color Tops Jester Action Figure. Condition is New but package has minor shelf wear, refer to photos. Still sealed new. Shipped with USPS First Class Package. Good used condition and are plenty presentable for another child. New character to the Titanfall universe. 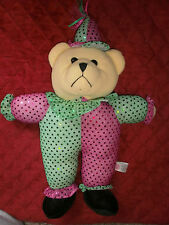 This is for a new Sugar Loaf Plush bear with a shiny cloths Approx 15"or 17 " with hat. Buy more and save on S&H. Titanfall 2 - Jester Action Figure - McFarlane Toys Free Shipping! At The Nile, if you're looking for it, we've got it. We've got this. Up for sale is the accessory for the gundam Jester Gundam from the TV series G Gundam.Accessory is in very good condition. Jester Gundam left open hand. Gundam accessory for. This is only for the item listed in the title. See picture for condition, you will receive the actual item in the picture. Ask for more pictures if you are unsure about the condition of the item. These were produced by Big Bang Pow! in 2014 and and were first seen at this years SDCC. Howard as a Jester "Renaissance Fair". I will do the rest for you. This is very important! 7 1/2" TALL AND DRESSED IN FULL "JESTER" CLOTHING. New character to the Titanfall universe. McFarlane Toys. FULL MOON TOYS: PUPPET MASTER, "JESTER", FROM THE HIT FILM, 1998, NEW/UNOPENED! FULL MOON TOYS: PUPPET MASTER, "JESTER", FROM THE HIT FILM, 1998! I have experiences in the comic industry for over 40 years. I specializes in Bronze, Silver, Golden age comics plus rare/highly sort after comics/complete sets/collectibles. 4.5 out of 5 stars - FULL MOON TOYS: PUPPET MASTER, "JESTER", FROM THE HIT FILM, 1998, NEW/UNOPENED! 3 product ratings3 product ratings - FULL MOON TOYS: PUPPET MASTER, "JESTER", FROM THE HIT FILM, 1998, NEW/UNOPENED! Collectible The Greatest Show on Earth Monkey Clown Jester Ultra Plush Tags 18"
He is wearing a cheerfully bright jester hat, collar and bow tie of multi color satiny material. He has delightfully lush fluffy fur. He has the official Greatest Show on Earth seal on his foot. ~ ~ ~ . HOWARD RENAISSANCE FAIR OUTFIT. THE BIG BANG THEORY. Made of stone resin, this Frozen mini-bust stands 6 1/4" tall. (NON-NEGOTIABLE). What happens when The Big Bang Theory takes on The Renaissance Fair?. This Convention Exclusive features Howard as a Jester. Collect them all! Howard Wolowitz is an engineer in applied physics. He recently retired his 'ladies man' aspirations and married girlfriend Bernadette Rostenkowski, who he initially bonded with over disdain for their overbearing mothers. ~PRINCE DASTAN~BUST~. Sideshow Collectibles is proud to present the outstanding Disney Bust series from Grand Jester Studios and the creators of the Walt Disney Classics Collection. The Prince Dastan Bust was produced in high quality Polystone, then hand painted and finished to exacting standards which Grand Jester Studios is known for. McFarlane Toys Titanfall 2 Color Tops Jester Action Figure. Condition is New but package has minor shelf wear, refer to photos. Still sealed new. Left arm popped out but it can but put back in place. Shipped with USPS First Class Package.